Any change in the economic environment may mean that many organisations are challenged to reduce overall expenditure and to maximise efficiencies. At the same time organisations are preserving increasing amounts of digital material. Reuse of models can form a part of the response to this challenge. The long term management - preservation - of digital materials is an expensive and complex activity. It cannot reliably be done without the investment of resources and expenditure. Provide for the future of their digital materials in an economically sustainable way and helps reconcile the difference between short to mid-term funding commitments/funding cycles, and long-term preservation goals. Other organisations have already created templates for business cases and models for the calculation of cost and benefit, so reusing some or parts of these models can not only save time but be used as justification for the adoption of particular strategies. The business case is a tool for advocating and ensuring that an investment is justified in terms of the strategic direction of the organisation and the benefits it will deliver. It typically provides context, benefits, costs and a set of options for key decision makers and funders. It can also set out how success will be measured to ensure that promised improvements are delivered. It is essential that any business model or proposal that is created supports the wider aims and objectives of the parent organisation. It is equally important that key stakeholders, such as budget holders, are consulted and given early sight of the plans and offered the opportunity to comment and provide input. Early exposure of plans can to some extent mitigate situations in which plans might otherwise be rejected outright. However, presenting a business case for preserving any material at an early stage is no guarantee that it will be accepted. Whilst there is no sure fire template, some or all of the following steps may be useful if a plan is rejected. Within an organisation there may be set procedures and policies regarding the making and presentation of business cases and these should be followed. Early communication of business planning can help identify topics or areas that could present problems when the plan is formally presented. The point of business planning is to be aspirational and to create services or products that have value and benefit. Not everyone sees the benefits in preservation over the long term where costs are an ongoing issue or where resources are required to be committed for the long term. Business planning is often an exercise in pragmatism. It might be more effective to make a number of smaller more focussed business plans than one single large proposal. Using their knowledge of an organisation the author of a business plan must ensure that any plan is realistic and within the means of the organisation. Strategic planning provides the framework within which business plans are written. Any strategic objective can be achieved in a number of ways, e.g. less money but more time, fewer staff but longer timeframe etc. A pragmatic response offers decision makers a preferred option and why it is preferred and a small range of other alternative options in the business case. It is often helpful to include the "costs/dis-benefits of inaction" as an option against which other actions can be evaluated. Work with stakeholders to identify reasons why a business plan was rejected. Talk to those involved in decision making and seek specific feedback. Was the cost component too expensive? Were the plans too ambitious? Is it felt the business case was poorly written or presented? Does the timeframe not fit with organisational plans? Response: Work with stakeholders to address key concerns. Be clear to address each issue. Explain the reasons why a business plan was presented and what it is aiming to achieve. Focus on benefits, especially those that address the key strategic goals of the parent organisation. Focus on short as well as longer term benefits of the business plan. One approach is to create business plans that are 'SMART', that is Specific, Measurable, Achievable, Realistic and Timely. The hard work in business planning is getting to the point where a plan is accepted. However, circumstances can change. If a business plan is not implemented or previously agreed funding withdrawn, the implications can be severe. Again, communication with key stakeholders is essential and can reveal why something may have changed. Response: Part of business planning involves having a range of options that can be offered in the event of problems arising with funding a preferred option. Having a well-structured business plan from which proposals can be deleted can help in making an alternative case for phased or alternative implementations requiring fewer resources. In such a case a business plan might quickly be re-drafted in more acceptable terms and resources made available. Having a focus on why resources were not made available gives an opportunity for a business case to be re-presented with more emphasis on benefits and positive impact. The following steps should be considered when writing and delivering a business case. Audit your digital materials. Analyse the risks and opportunities for your digital materials. Use your analysis to prioritise areas of work and assign owners to them. What are you already doing? Is it the right time to do new things on your own? Can you collaborate with others? How ready is your institution for change in terms of content and process? Who will be working on and using the digital materials? Who decides on funding? Engage with them using language and terms they will understand. Map out what are you going to do, who will do what, what will it cost, and when it will happen. Make sure you express the benefits of your business case in a way that your funders will understand. 7. What else is needed? Do you need to include a cost-benefits analysis or list of options based on expenditure and outcome? Review and test your business case against best practice and identify what else it needs. Do you have a champion to use in the organisation? Remember you may need to deliver it again. Benefits are associated with costs and also with risks (see Risk and change management). If risks are mitigated these become a type of benefit. The purpose of the acquisition of any digital material is that it is used. The uses to which digital material is put represents a benefit to those users. If an organisation needs to understand costs associated with digital materials then it must also understand benefits. Benefits can be used to justify costs through the development of business plans. Measuring benefits is often quite challenging, especially when these benefits do not easily lend themselves to expression in quantitative terms. Often a mixture of approaches will be required to analyse both qualitative and quantitative outcomes and present the differences made. To assist institutions, the Keeping Research Data Safe project created a KRDS Benefits Framework and a Benefits Analysis Toolkit (KRDS, 2011). 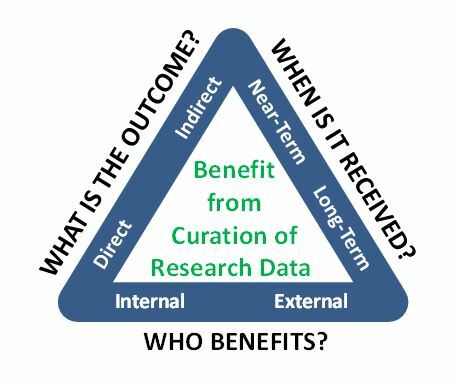 These aim to help institutions identify the full scope of benefits from management and preservation of research data and to present them in a succinct way to a range of different stakeholders (e.g. when developing business cases or advocacy). The toolkit is also easily applicable to the benefits of digital preservation to other classes of digital materials. The KRDS Benefits Framework uses three dimensions to illuminate the benefits investments potentially generate. These dimensions serve as a high-level framework within which thinking about benefits can be organised and then sharpened into more focused value propositions using the Toolkit. It helps you identify what changes you are trying to deliver, what are the outcomes, who benefits, and how long it will take to realise those benefits. A business case will normally look at not just the establishment cost for the digital preservation solution, but the all-in cost, including project/program management costs and other activities being undertaken to support implementation such as training and publicity. However digital preservation costs are often the most critical element. Why understand digital preservation costs? Planning and budgeting to build a new repository from scratch, or to extend an existing one. Adding a new digital material to your repository and deciding if you can afford it now or over the long-term. Providing a platform for comparison with like organisations and an opportunity to adopt efficiencies that have been identified by others. Deciding whether to outsource activities or do it in-house. Deciding how much to charge for providing a digital preservation service to clients. Understanding where resources are being used or under-utilised and areas where additional allocation of resources might be beneficial. What is lifecycle cost modelling? Starting out with curation costs - provides an introduction to the concepts. Using cost models - describes how to select a cost model appropriate to your organisation. Cost Concept Model and Gateway Specification - provides more detail including a guide to develop a model to your own requirements looking at concepts such as 'risk', 'value', 'quality' and 'sustainability'. Articulating the drivers or aims for costing digital preservation. Digital preservation is a moving target, defined by changing technologies and evolving institutional requirements. Level of detail: At a high level, modelling becomes less useful as it typically relates to a cross section of different preservation contexts. Modelling at a low level quickly becomes highly complex, making models difficult to develop, maintain and put into use. Organisations are reluctant to share costing data, with which models may be developed and validated. Even where costing data has been shared, it is often difficult to map between the different costing models it is associated with. For this reason, modelling digital preservation costs across the lifecycle is an activity that should be approached with caution. Cost modelling will always be an approximation and so you need to decide the amount of time you are willing to put in to gain a less approximate answer. It is possible to manage costs through careful planning. One way is through good process design. The ways in which digital material is created or acquired, managed and disseminated attract costs. Those costs are at the discretion of the organisation and can be managed. The end to end process from acquisition to dissemination must be designed to ensure that all activities are as efficient as possible. All steps should be designed in such a way as to minimise the need for resources, whilst maximising efficiency. Whilst efficiencies work well at scale, an efficient process doesn't have to be a high volume process. Automation of systematic steps can also save time and deliver effective consistent processes. The initial costs of process design and implementation can be offset by longer term returns. Impact is typically the measurement of benefits particularly to the wider public and society undertaken after a business case project has delivered. For small projects and business cases, impact may be just a simple set of measures such as downloads or number of website requests against which success can be benchmarked easily. For larger projects and programmes, it may be part of a more thorough evaluation to justify the resources expended. It can include a mixture of quantitative and qualitative measures and will normally be undertaken by external specialists working with staff from the repository. They employ methods from economics and management and information science, for example cost-benefit analysis or contingent valuation, and traditional social science methods such as interviews, surveys and focus groups. Measurement involves choosing metrics or indicators and requires careful planning and agreement about what to measure and how. Metrics often employ readily countable things such as downloads, or scales metrics that are not truly numeric, such as rating scales or categories of variables. Typically there is a trade-off between what ideally should be measured (e.g. users and use) and proxy measures which are easy to capture and measure (e.g." unique visitors" and web downloads). The Blue Ribbon Task Force investigated sustainable digital preservation and access from an economic perspective. This final report, identifies problems intrinsic to all preserved digital materials, and proposes actions that stakeholders can take to meet these challenges to sustainability. It developed action agendas that are targeted to major stakeholder groups and to domain-specific preservation strategies. (2010, 116 pages). This synthesis summarises and reflects on the combined findings from a series of independent investigations into the value and impact of three well established UK research data centres or services (the Economic and Social Data Service, the Archaeology Data Service, and the British Atmospheric Data Centre). The studies adopted a number of approaches to explore the value and impacts of research data services and the data sharing and archiving that they have enabled. Data collection involved focused user and depositor surveys, and data centre financial and operational data (e.g. user registrations, dataset deposits and downloads), supplemented by in-depth interviews. Not all impacts can be captured and quantified; therefore they have used these economic approaches with others, such as the KRDS Benefits Framework, to illustrate wider benefits. (2014, 26 pages). Provides a starting point for considering the issues necessary to create and build a business model that will support sustainability of digitisation and digital collections. The European Union funded 4C project aimed to help organisations across Europe to invest more effectively in digital curation and preservation. A series of reports and resources were produced and are available from its outputs and deliverables page. These include the Digital Curation Sustainability Model , an Evaluation of Cost Models and Needs & Gaps Analysis, a Report on Risk, Benefit, Impact and Value, and a Draft Economic Sustainability Reference Model. The evaluation of costs models report evaluates ten available cost models including, KRDS and LIFE. 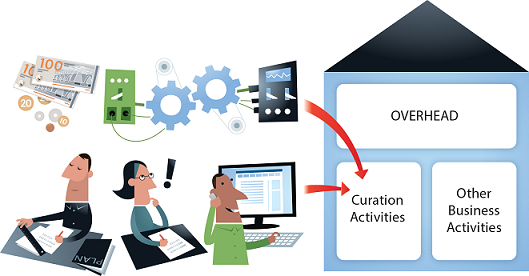 Another major output was the Curation Costs Exchange (CCEx), a community owned platform which helps organisations of any kind assess the costs of curation practices through comparison and analysis. The CCEx aims to provide real information about costs to help make more informed investments in digital curation. The CCEx was launched in 2014 by 4C and is now maintained and governed by the Digital Preservation Coalition (DPC) with help from nestor and The Netherlands Coalition for Digital Preservation (NCDD). This Toolkit provides an in depth guide to writing a business case that is focused on digital preservation activities. It's targeted at practitioners (and their managers) who are working with digital resources and would like to obtain funds to expand their digital preservation activities. The Toolkit is primarily aimed at those seeking further funds from within their organisation, but could also provide useful information for those writing a bid for project funds from an external funding body. It includes a Step by step guide to building a business case and a Template for building a business case. Created by the Jisc funded SPRUCE Project in 2013 the toolkit wiki is hosted by the DPC. Keeping Research Data Safe (KRDS) is a series of cost/benefit studies, tools and methodologies that focus on the challenges of assessing costs and benefits of curation and preservation of research data. Although focussing on research data, the tools are easily customised to apply to other areas of digital preservation. Available outputs include a KRDS Factsheet, a KRDS User Guide, a KRDS Activity Cost Model, and a KRDS Benefits Analysis Toolkit as well as supplementary materials and reports. The KRDS projects between 2008 and 2011 were funded by Jisc. The MetaArchive Cooperative has produced a set of 20 questions to "assist institutions with their comparative analysis of various digital preservation solutions". This work marks a move away from the development of detailed predictive costing models towards a more general approach that seeks to identify and understand key cost drivers rather than the actual costs themselves. David Rosenthal is a frequent blogger on the topic of storage costs, often considering the impact of the evolution of storage technology on preservation costs and on cloud storage. A bibliography that "ranges broadly, from articles on "contingent valuation," "ecosystem valuation" and the general "costs" of knowledge, to those that directly address the cost issues associated with digital preservation and stewardship". A list of digital preservation cost models and cost modelling initiatives. The background to this case study is provided in the Archaeology Data Service (ADS) dissemination workshop presentation. Worked examples are available of the ADS Benefits Framework Worksheet (PDF) and the ADS Value-chain and Impact Worksheet (Excel 97-2003). The background to this case study is provided in the Medical Research Council Cohort Studies dissemination workshop presentation. A worked example is available of the Cohort Studies Value-chain and Impact Worksheet (Excel 97-2003). The background to this case study is provided in the SageCite dissemination workshop presentation. A worked example is available of the SageCite Benefits Framework Worksheet (PDF). The background to this case study is provided in the UKDA dissemination workshop presentation. A worked example is available of the UKDA Benefits Impact Worksheet (PDF). A collections audit and business case focused on taking the first steps of digital preservation. A review of approach and generation of a business case for digital administrative record keeping. Assessment of digital repository solutions and an associated business case for digital preservation. A trial of media stabilisation and content preservation along with a business case to move to a production status.